Description: This course is designed to meet the requirements of OSHA for refresher training of emergency response personnel who will respond to leaks or spills of chemicals for the purpose of stopping the leak or spill. It is specifically aimed at ammonia users, but will relate to many other chemicals. It can be tailored to other specific chemicals in your workplace. OSHA requires that all personnel who are expected to respond to spills or leaks must have this annual refresher training. The attendees will participate in the hands-on setup of a staging area. What's more, the design and setup of the staging area will come from the team members attending the class by means of the guidance of the instructor. As a result, the response team will have a more efficient management of equipment for during an actual emergency response situation. Scenarios are planned that will simulate conditions indicating that a spill or leak has occurred. The teams will form and lay out all their emergency equipment. 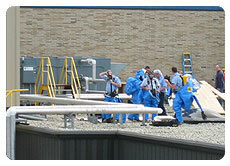 They will assess the situation and determine what emergency equipment they will need to stop the leak. The teams will then approach the spill and simulate the repair. Critiques will then be held to look for weaknesses or changes that should be made in the future scenarios. All personnel will be given the opportunity to wear the SCBA and wear the fully encapsulating training suit in practice. At some point during the day the attendees will be required to take a 25 question examination and upon satisfactorily passing, will be awarded an 8 hour refresher certificate and an emergency responder identification wallet card to be used when responding to actual spills.